'Webtribution' is the Wall Street Journal's name for using the Internet to get revenge for the acts of others. 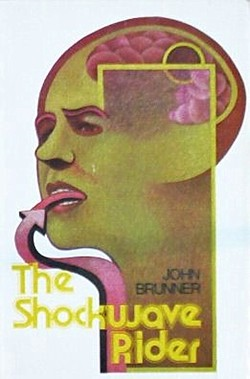 Science fiction fans are way ahead, as usual; John Brunner originated the idea about thirty-five years ago. Every person you know—each family member, friend, co-worker and casual acquaintance—receives an anonymous email from a stranger making terrible accusations about you. Several years ago, Ms. Holder discovered that dozens of her MySpace friends had received an anonymous email calling her a tramp and a home-wrecker. For weeks, she tried to counter the allegations, which she says came from her new boyfriend's former girlfriend. She methodically contacted each person she believed received the email and explained that she hadn't started dating her boyfriend until months after he had broken up with his ex. But the harm was already done. Family members called her and questioned her morals. Co-workers whispered about her behind her back. Several friends cut her off completely. "It took me far longer to repair the damage than it took that woman to create it," says Ms. Holder, a 34-year-old customer-service representative in Austin, Texas, who eventually married her boyfriend. "In a matter of minutes, she spread a rumor internationally." According to recent report, there were so many worms and counter-worms loose on the data-net now, the machines had been instructed to give them a low priority unless they related to a medical emergency. Read more in the Wall Street Journal, while they're still accepting your click-thru.